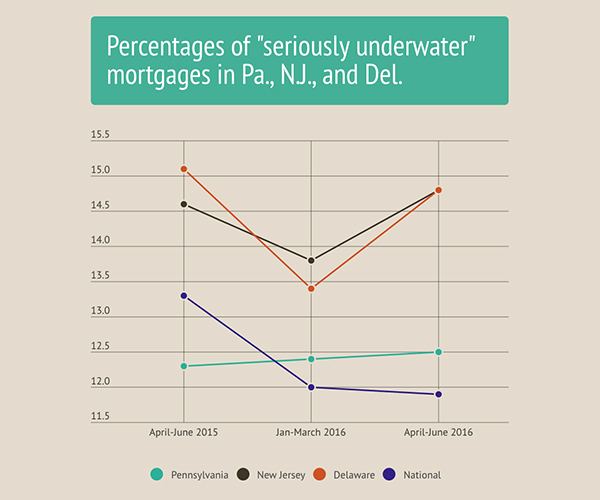 The percentages of “seriously underwater” mortgages in Pennsylvania, New Jersey, and Delaware all exceeded the national average in the second quarter of 2016, according to new data. All three states also saw their percentages of seriously underwater mortgages increase since the beginning of the year, while the national average dropped slightly. Being underwater on your mortgage means that you owe more on the loan than the value of your home. Being seriously underwater means you owe at least 25 percent more than your house is worth. Blomquist speculates that the uptick in seriously underwater mortgage rates in Pennsylvania, New Jersey, and Delaware can be attributed to a lagging foreclosure process that recently picked up. 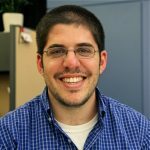 As more foreclosed homes are sold below market-rate, he said, the values of their neighboring properties will also drop, but mortgage payments will remain the same. About 6.7 million mortgage loans were seriously underwater nationwide between April and June of this year, making up 11.9 percent of total mortgages, many of which were taken out during the bubble of the mid-2000s. 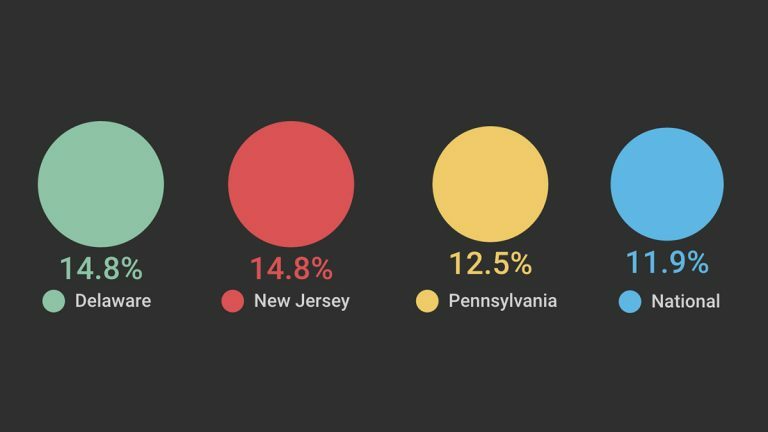 In Pennsylvania, 12.5 percent of mortgages were seriously underwater. Rates were even higher in New Jersey and Delaware, where seriously underwater loans made up 14.8 percent of mortgages. The numbers underscore the notion that the national financial recovery is taking longer to reach Pennsylvania, New Jersey and Delaware. Zooming in on certain areas shows an even more dire picture. 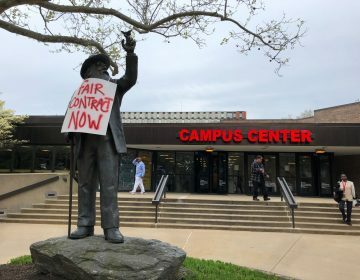 Exceedingly high rates of seriously underwater mortgages occurred in Juniata County (50 percent) and Monroe County (45 percent) in Pennsylvania, as well as Atlantic County (33 percent) in New Jersey, which has been facing the aftershocks of repeated casino closures over the last few years. In Trenton, the overall rate of seriously underwater mortgages is 20.4 percent, but some parts of the city a deluge of debt. Two zip codes just east of the State House (08629 and 08690) have seriously underwater mortgage rates just above 60 percent. In a southern part of the capital city that borders the Delaware River, three in every four mortgages is seriously underwater. 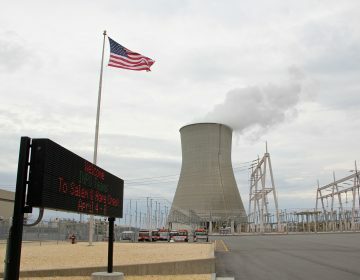 In a part of Tobyhanna, Pa., the rate hovers at 68.3 percent. Despite the high volume of debt, said Wharton Business School professor Susan Wachter, the overall market is on the upswing both nationally and locally. The flip side of the slow recovery in Pa., N.J., and Del., according to Wachter, is that people looking to buy a new home may still find the area affordable.